We shot a limit of teal (small ducks) this year on one of our trips. It was two of us and my buddy did not want to take his share and deal with the clean-up. I was happy to take his share of the hunt (even if I am never happy about the cleanup of about 12 ducks). In any case I had a good mess of birds in my freezer, mostly plucked clean but with several skinned and portioned out into small legs and breasts. 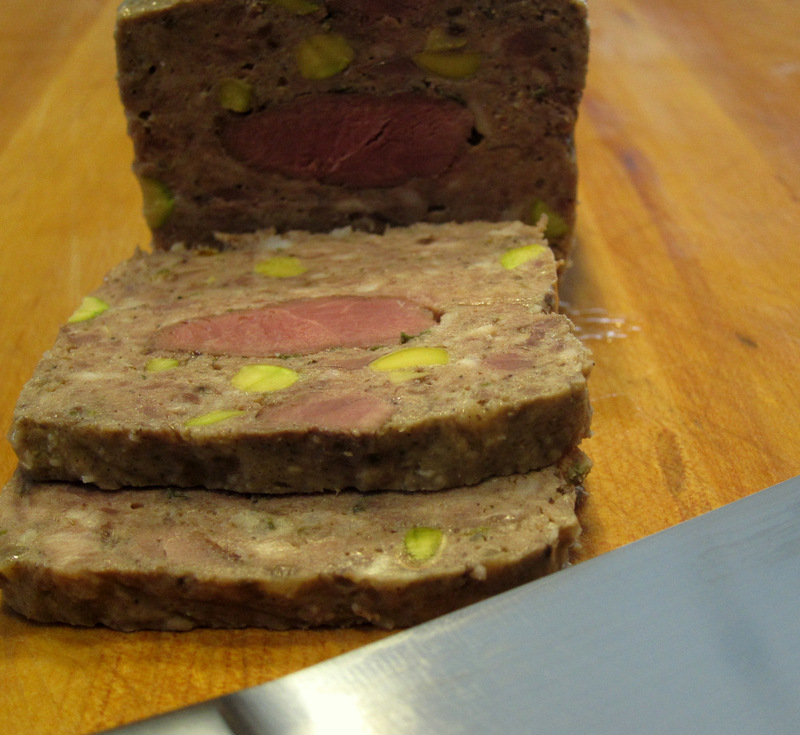 It’s also been a while since I made a terrine of any sort and it really is the season for that kind of stuff. So a terrine of teal (and one bigger bird from last season) it was. I have tons of recipes for terrines and pates, but for this one I looked to a little book that I love reading and cooking from, Richard Olney’s Simple French Food. The late Olney is also the author of the many of the Good Cook series of books including one I’ve mentioned before and own called Terrines, Pates and Galantines. His writing in Simple French Food and The French Menu Cookbook is clear and passionate. These are really classics with no frills, no pictures, great opinionated essays and recipes that teach and work. Either one is a great addition to any foodie’s bookshelf. 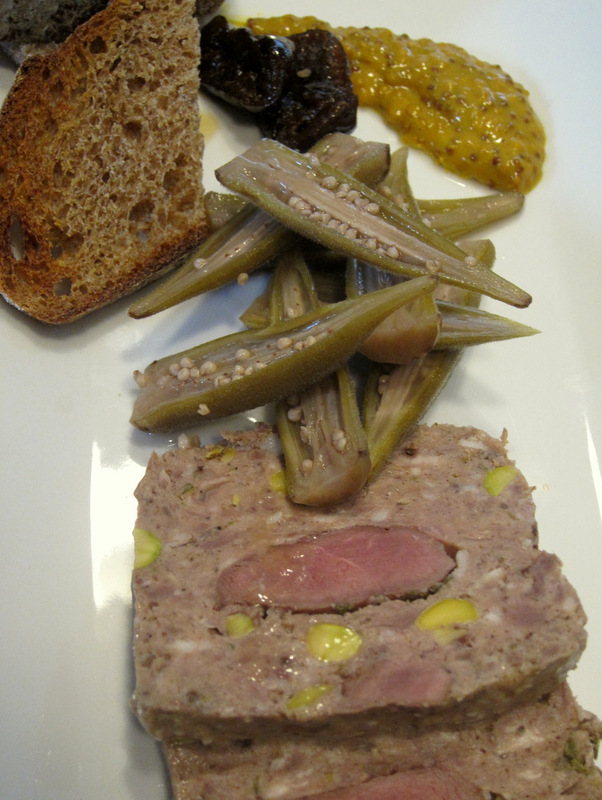 Olney does not have a recipe for teal terrine in his book but he does have one that caught my eye for Terrine de Lapin, rabbit terrine. I could have used one of several other recipes from other books including Terrines, Pates and Galantines, but as I mentioned before I just love reading and cooking from Simple French Food. It’s that kind of book that makes you want to get in the kitchen and make something. I basically used the duck in place of the rabbit. 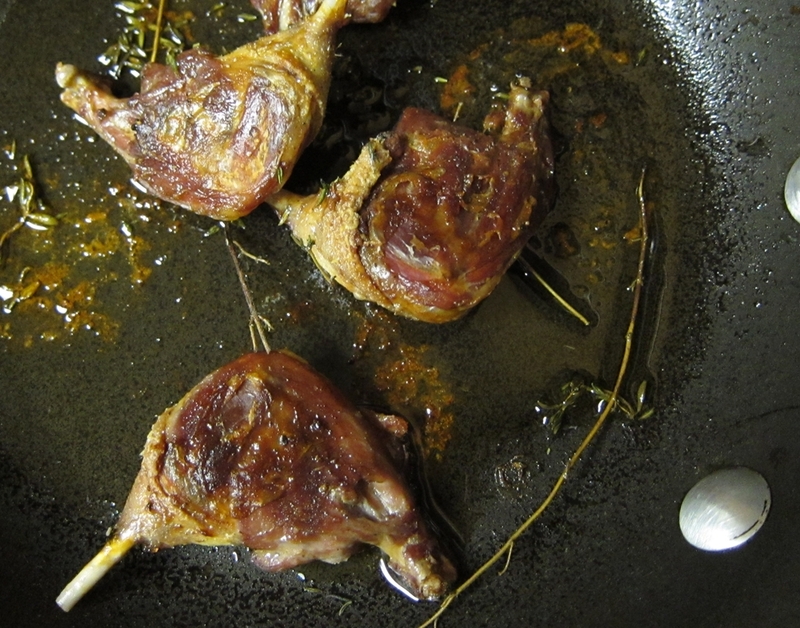 Some other changes I made was to make the seasoning a bit more aggressive since duck, especially wild duck, is more gamy than rabbit. Instead of marinating and grinding all the duck, I followed Olney’s instruction to marinate the meat in a mixture of white wine and herbs but I reserved the breasts after marinating and seared them to use them an inlay in the center of the terrine. 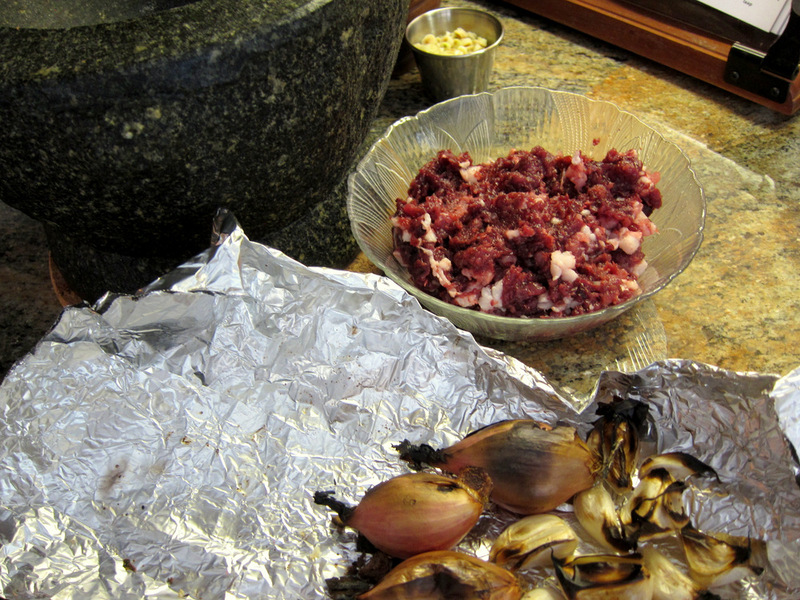 The remaining duck meat was ground up with some pork shoulder to start making the forcemeat. The terrine usually needs a small amount of a liquid-ish component. This can be composed of milk, cream, stock or even water mixed in with seasoning and bread to make a paste (known as panade). 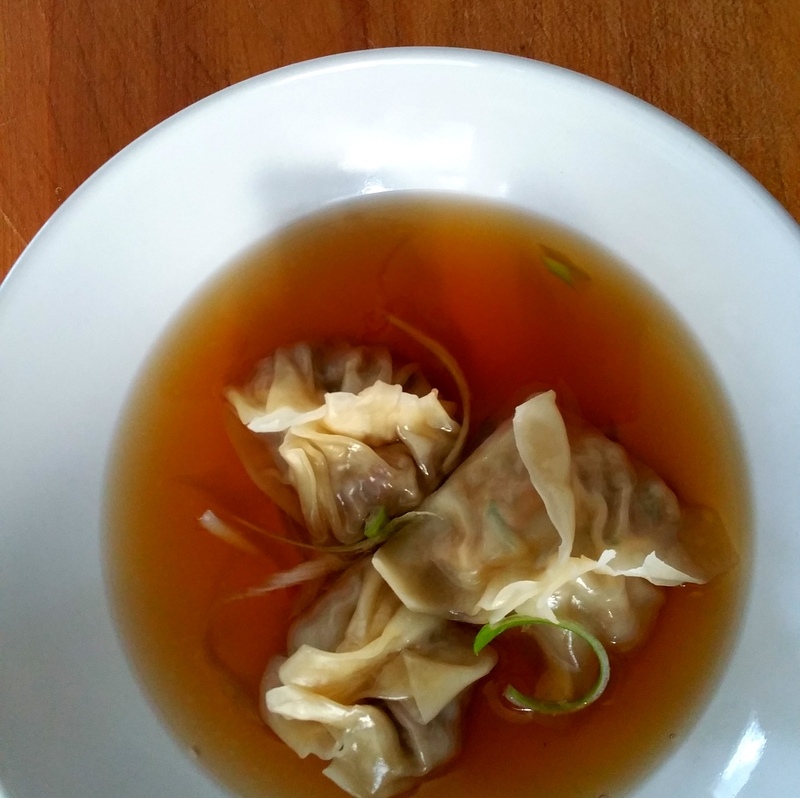 For this recipe I used the duck carcasses to make a stock in my pressure cooker. I first roasted them and then deglazed with Madeira and a bit of Sherry vinegar before cooking with mirepoix and thyme on high pressure for about an hour. This made about 4 cups of stock. I then reduced it to about half a cup of concentrated meaty goodness. This got mixed with a mashed a garlic clove and chopped up bread to make the panade. 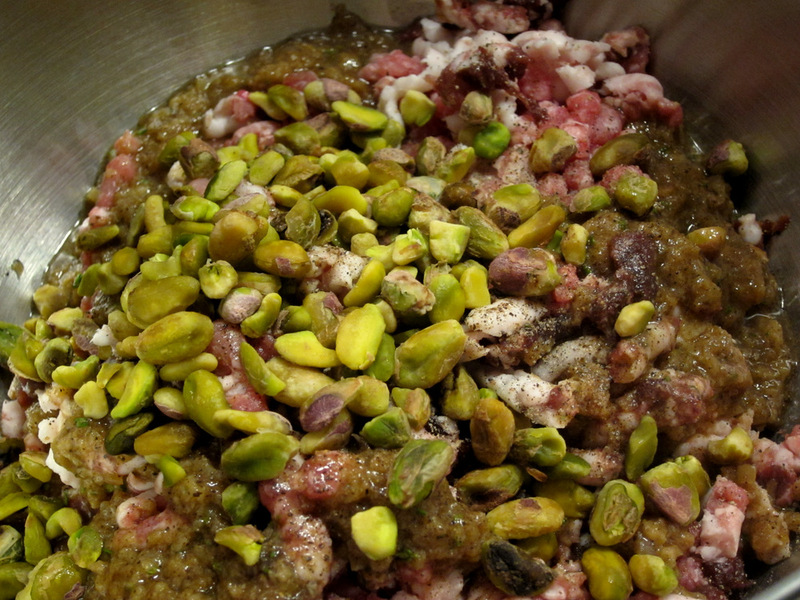 I ground up the mixture into both fine and coarse portions that got mixed together along with pork fat, pate spices, panade and pistachios. I used the KitchenAid mixer to get the forcemeat really emulsified and bound together well. Half of that went in a plastic wrap-lined terrine pan and then in went the seared duck breasts and then the remaining forcemeat mixture. 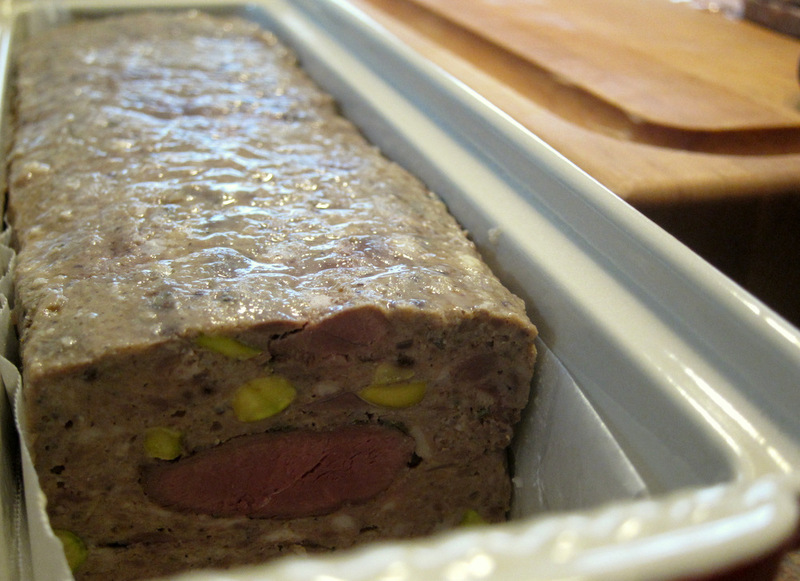 Traditionally a terrine is cooked in a bain marie (basically a water bath in the oven). The idea, just like cooking a flan or custard, is to gently heat the mixture and not allow it to break with all the fat and juices running all over the place. Well that is really sous vide cooking old-style. So for the past couple of years I’ve been using my immersion circulator for that. 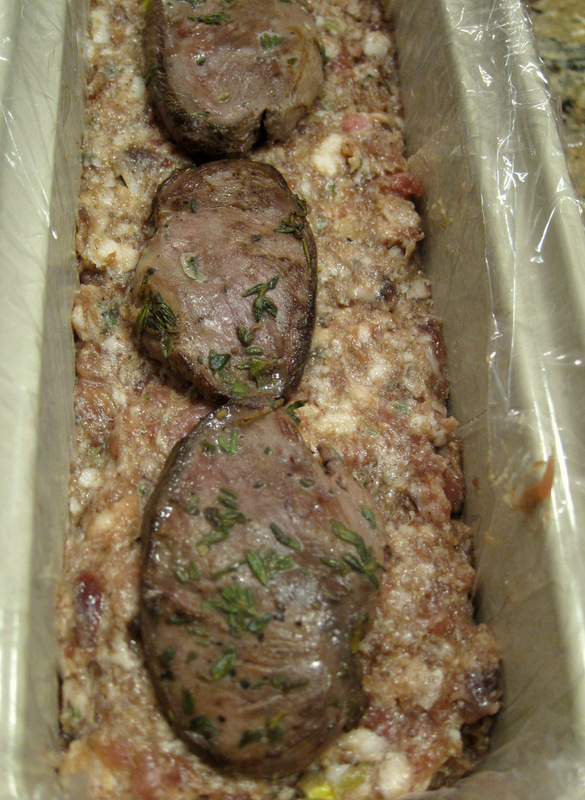 I wrapped the terrine with plastic wrap and then vacuum packed the whole thing using a FoodSaver. The package cooked at 63.5 degrees C for about 3.5 hours. 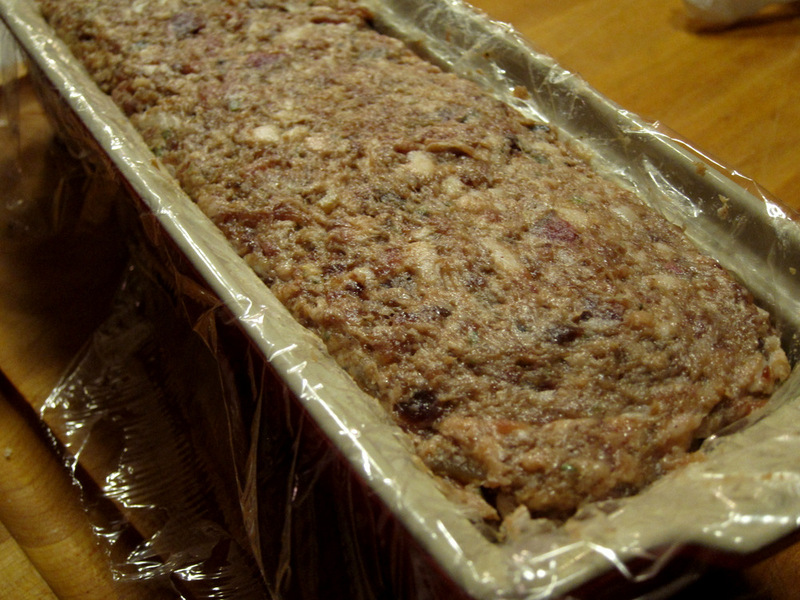 The other plus with this method is that the finished terrine is already wrapped and pasteurized. It can be cooled in an ice bath and go into the fridge. It also needs no pressing with a weight to compress the meat and remove any air bubbles. We ate this over a period of a week or so with good bread and various accompaniments like mustard, ale chutney and cornichons. I also loved it served up with pickled prunes, homemade coarse mustard and fermented pickled okra. The strong pickle flavors worked very well with the mildly gamy meat. I do want to add some curing salt (Sodium Nitrite, Cure 1,…) next time around to give it a more attractive pinkish hue and cured flavor. I forgot to do that this time around. I travel a lot for work typically for a project in one city that could take anywhere from a few weeks to over a year. Travelling every week for a few days to the same city can be weary. The upside to this latest particular engagement is that it is in the lovely city of Portland, Oregon. The weather is just perfect for me, the scenery is beautiful and the food is brilliant. I honestly have not had a bad meal in this city. One of the places that I had on my list to visit in a city full of good eats is Andy Ricker’s Thai place, Pok Pok. I’ve eaten several fantastic meals over there so far so getting the book and trying a few of the dishes at home was of course to be expected. We’ve enjoyed several meals from the book and all have been very good. The papaya salad I tried first was pretty much identical to what I had at Pok Pok. The stir fried rice noodles with pork, Chinese broccoli and soy sauce (Phat si ew) was an excellent one dish meal. 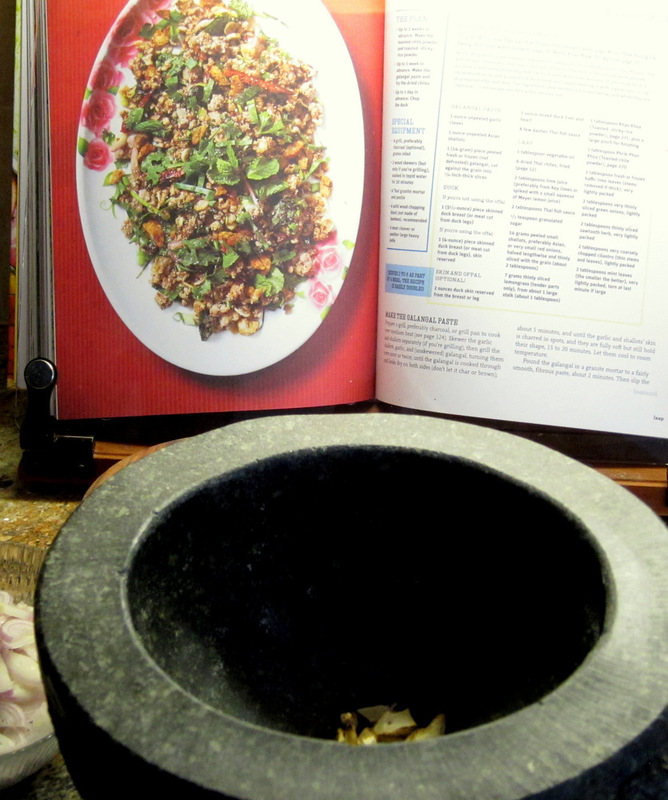 So, I was very pleased when Nathan chose a few recipes from Pok Pok for our Friday dinner. 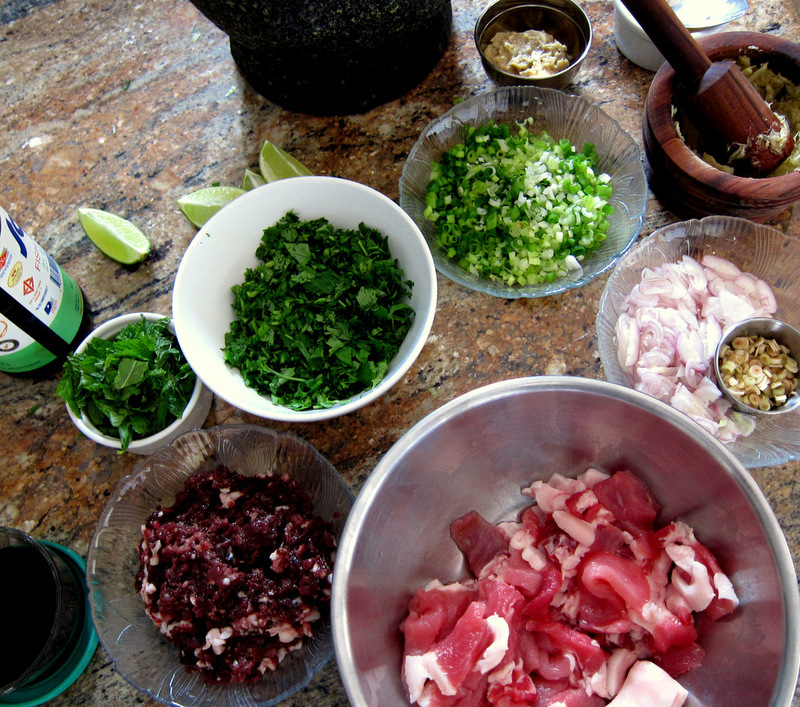 The recipes are pretty simple but involve a lot of chopping and prep work. The fried rice, like all stir fries, really needs all the ingredients ready to go in order into the very hot wok or else you end up stressed and the your stir fry crappy! 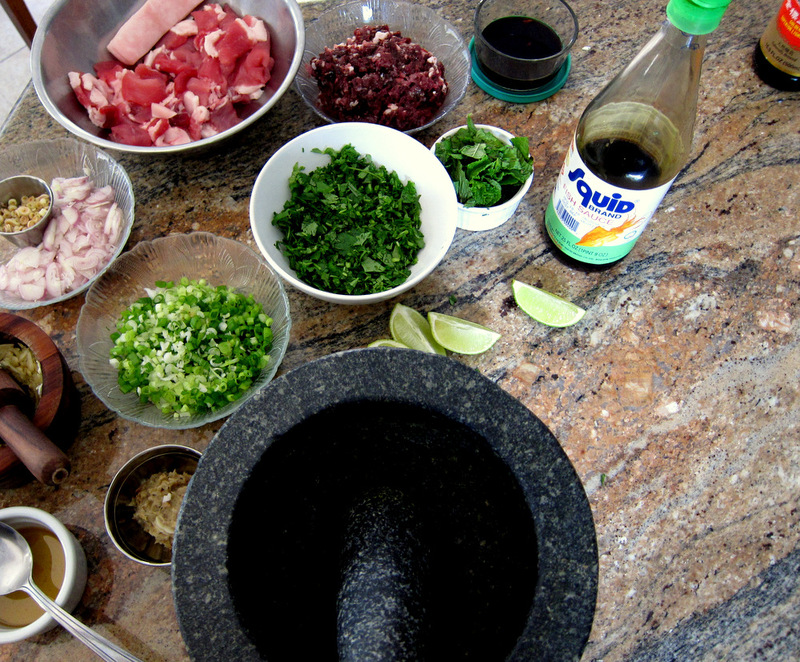 Pok Pok refers to the sound cooks make when using the mortar and pestle. That’s where many of the “salads” are prepared like this cucumber salad. Strictly speaking this is my version of Ricker’s cucumber salad (Tam taeng kwaa). I simplified it a bit and removed the noodles he serves with it since we are already having rice. 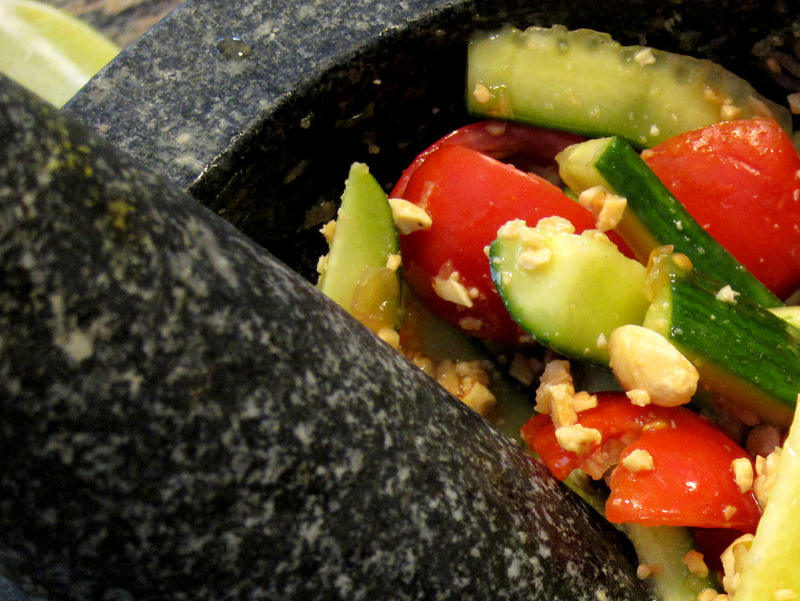 I prepared it like I do the papaya salad in the granite mortar by mashing some garlic, limes, palm sugar and salt together. Then the sliced cucumber goes in and gets a bit bruised along with cherry tomatoes before being seasoned with more lime juice and fish sauce. I garnished the salad with crushed peanuts for texture and because they taste wonderful with the cukes and the rest of the menu. 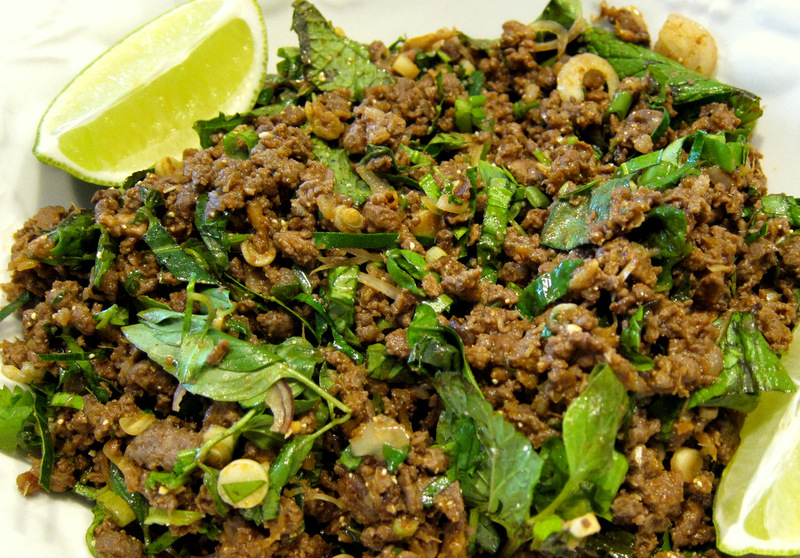 Laap is another dish that in typical Thai menus in the US is referred to as a “salad”. I’m not sure why that’s the case honestly, but really these are mixtures of minced meat (pork, chicken, fish or game) that are cooked fairly quickly with lots of traditional Thai aromatics. 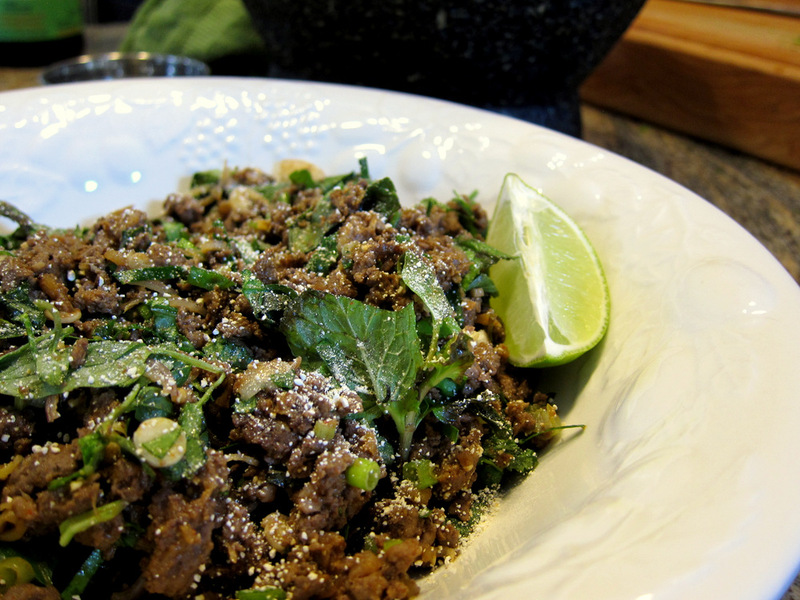 This version is labeled as Isaan minced duck salad (Laap pet Isaan) and is a bit more complex than previous versions I’ve cooked. Typically Laap is flavored with lime juice, shallots, lemongrass and some herbs with a sprinkling of toasted rice powder for crunch. 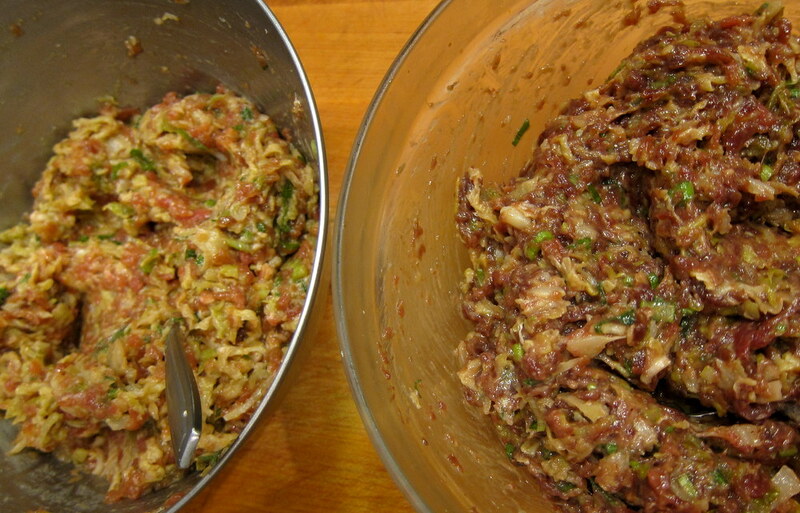 This Isaan version adds more spice in the form of a galangal-garlic-shallot paste. I first broiled the sliced galangal along with the shallots and garlic then wrapped them in foil and let them bake and soften. These were then pounded in the mortar to form the paste. 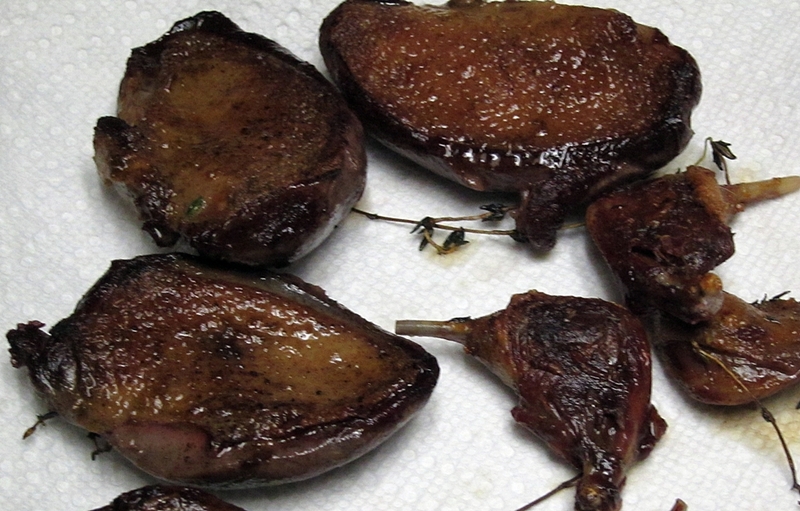 I still had boneless skinless wild duck in my freezer from my hunt in the fall. It made perfect sense to use those in place of store-bought ducks. 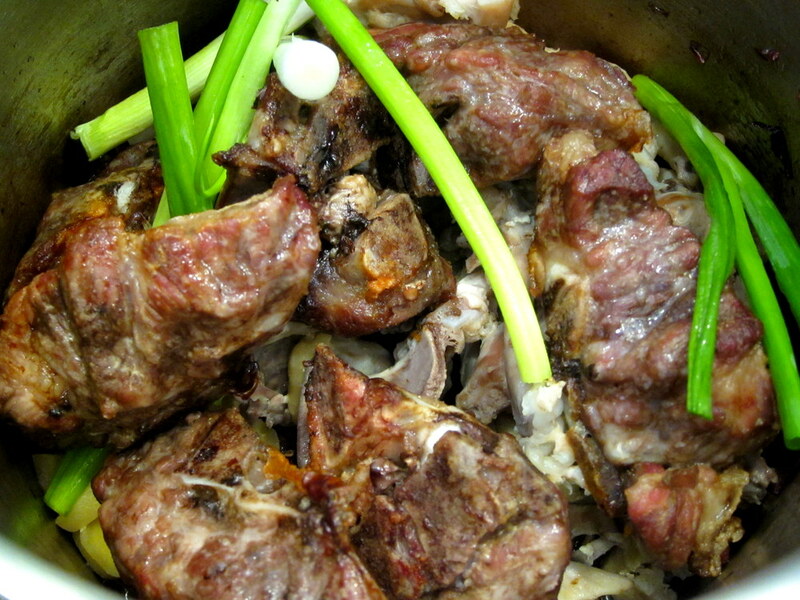 The wild duck’s gamy flavor worked great in this heavily spiced and fragrant dish. 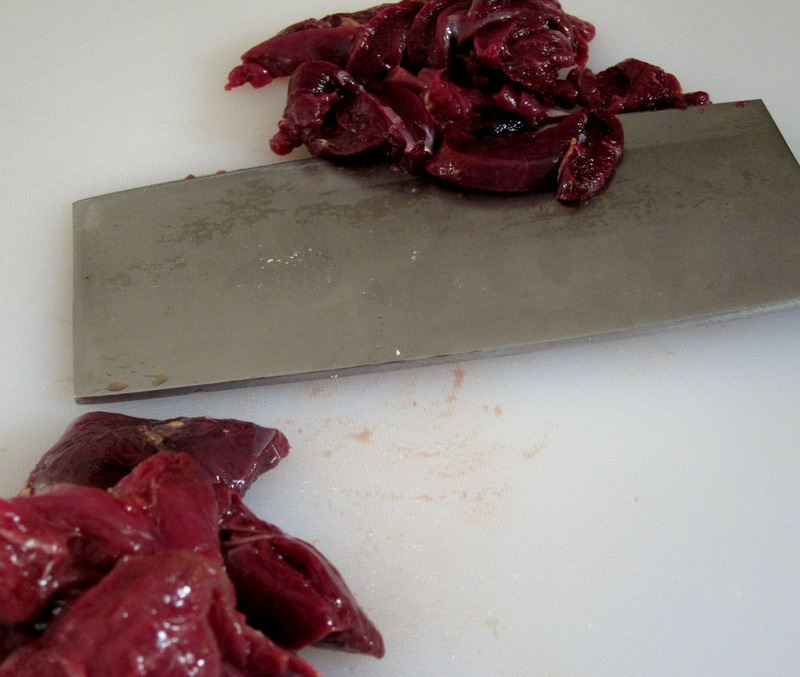 I used my cleaver to slice and mince the duck meat to maintain a nice texture and it’s quiet relaxing really. It took maybe 10 minutes to reduce the duck from breasts to minced meat. The duck is cooked with the paste and sliced shallots until just cooked through then flavored with sliced lemongrass, kaffir lime leaves, green onions, dried chilies, lime juice and fish sauce. Before serving I tossed in plenty of herbs (Thai basil, basil, mint) and toasted sticky rice powder. It’s a very exotically flavored delicious dish with more toasted rice powder sprinkled on top for more crunch. 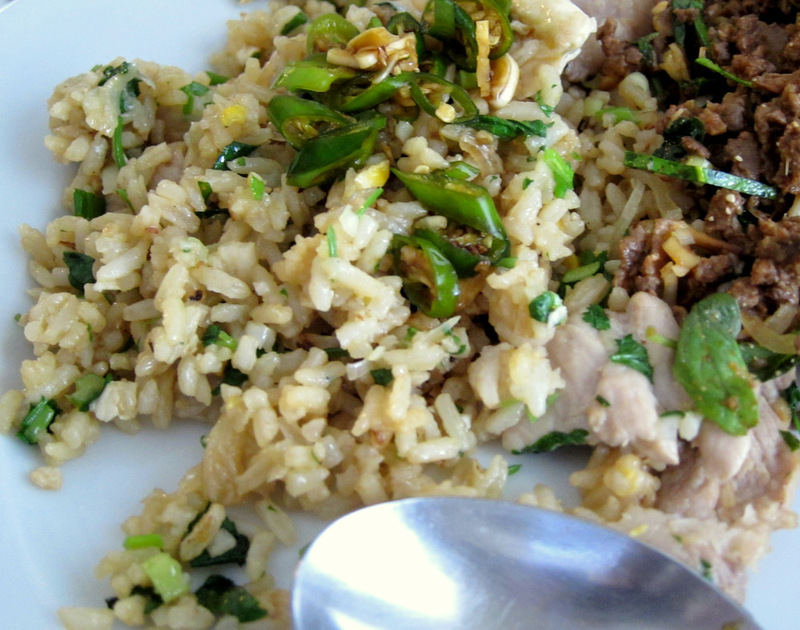 The Thai fried rice is really simple, but like I said before it works much better if you prepare all the ingredients and have them ready to go into the wok (or large skillet). The whole cooking process takes maybe 6 or 8 minutes and you do not want t be chopping shallots in the middle of that. I’ve really been enjoying using my outdoor propane burner (a.k.a turkey fryer rig even though I’ve never fried a turkey) for stir-frying in my large carbon steel wok. I use that same rig to brew beer and whenever I deep fry anything. Using the wok on it though is such an exciting way to cook and feels like playing with fire! I get all my ingredients on the outdoor table next to my wok and start tossing them in one after the other sizzling and charring where needed before getting the sauce in to bring everything together. It’s quiet the rush! For this recipe first goes the shallot oil, then the egg followed by shallots and garlic. 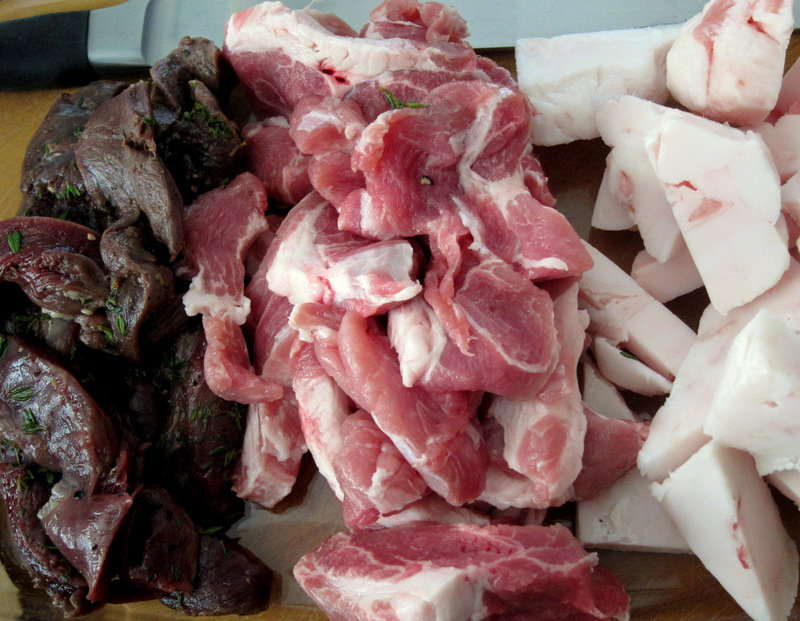 Everything gets tossed with pork…stir…toss (up in the air if you feel like it) until the meat is cooked through. In goes the rice and gets fried for a minute then a sauce goes in made from soy sauce, fish sauce, sugar and some lime. Done and delicious with fish sauce marinated chilies. 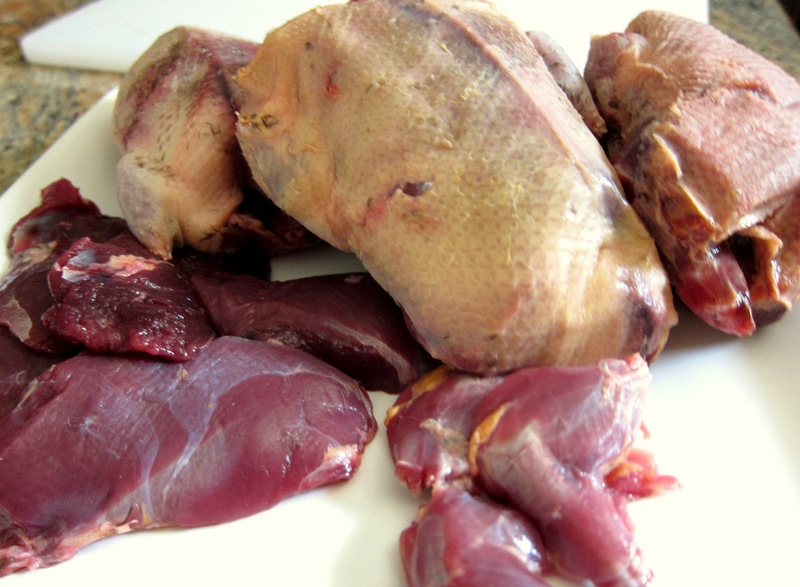 I’m still working on my wild duck cooking skill and the best result I’ve gotten so far is through removing the breasts and legs and cooking them separately. I’ve made a “quick salad” for my kids and I recently and I basically sautéed everything for different times and then sliced and served on top of a tart green salad. That was very nice and I achieved the well cooked crispy legs I complained about missing in this post. I also managed to get the breasts to be medium with a crispy skin, but some parts were over-cooked a bit and overcooked wild duck is not a very good thing. For this dish I took it to the next logical level and did what experienced cooks and chefs always instruct us to do: cook the breasts and legs separately each to their optimum doneness. It’s that “optimum doneness” part that can be a bit tricky while shooting for a crisp skin on such lean small birds. The way I tackled it is to cook the breasts sous vide and the legs baked in a very hot oven. The legs were well-done and crisp and the breasts were a lovely medium rare and a nice rosy color, even after a quick sear in a hot pan to crisp the skin. Before cooking the meat I simply salted it and rubbed it with a bit of thyme the night before and the breasts were packaged in FoodSaver bags with a bit of butter in there before going in the water at 55C for about an hour. 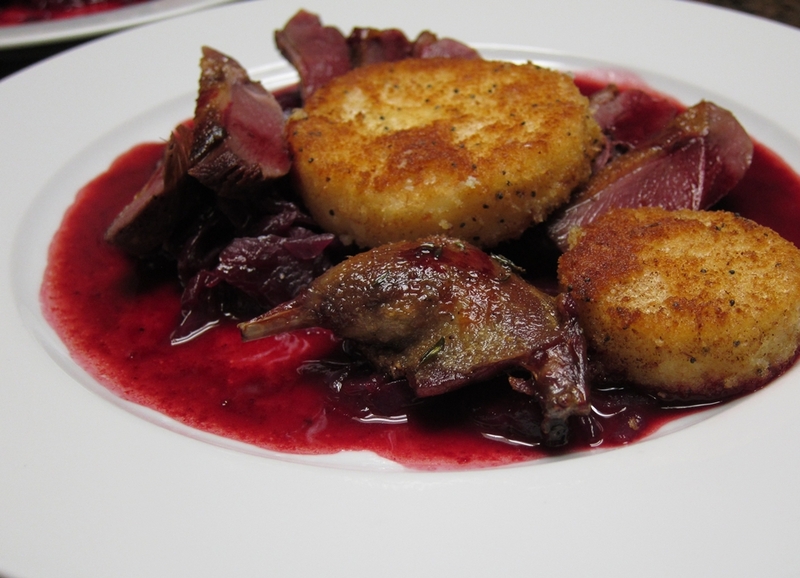 To go with the duck I made red braised cabbage and fried hominy cakes. The cabbage is from Gordon Ramsey’s “*** Chef” that I posted about a while back. It’s a very simple recipe of cabbage, butter and vinegar. 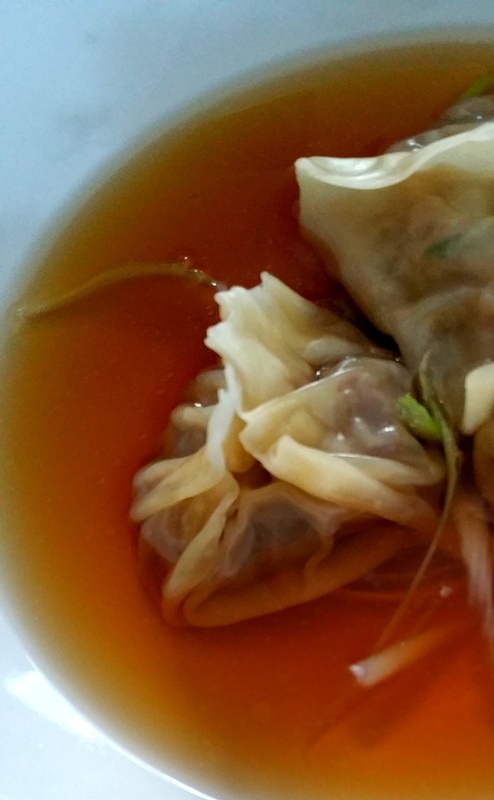 The end result is delicious and very flavorful, much more than the sum of its parts. 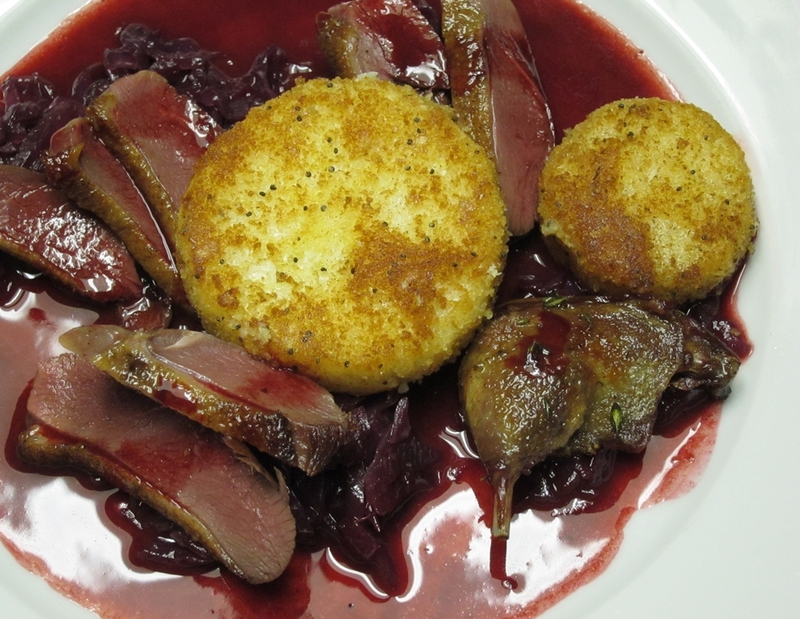 The hominy cakes are another direct rip off from Hank Shaw where he also pairs it with duck, canvasback to be exact. I followed Hank’s recipe verbatim and it worked perfectly. The grits cakes held together and had a great crispy exterior and a lovely soft interior. The flavor was mild and it really offset all the other robust flavors in the dish from the duck, cabbage and sauce. The dish needed the texture and the cakes delivered it in strides. The bread crumbs I used were made from a loaf of bread I baked with poppy seeds and that’s why the cakes’ crust has all these little black specs in it. That looked pretty neat and worked well with the sort of Germanic theme of dish. The sauce here is based on the duck carcasses. After removing the breasts and legs, I cut up the remaining bones and trimmings and made a stock with them. I wanted the stock to be robust and full of flavor, so I first roasted the cut up oil-rubbed carcasses and sautéed a bunch of aromatics in the drippings in the pan. Then I deglazed the pan with Madeira and sherry vinegar. 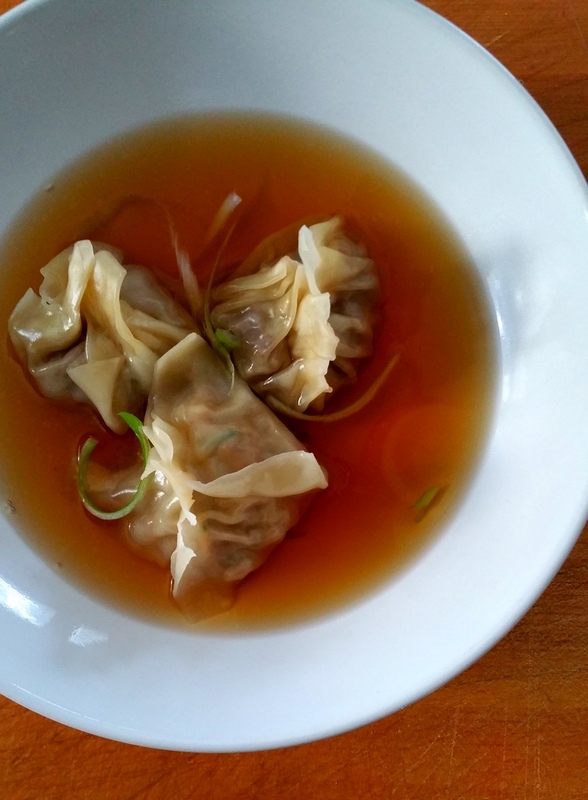 Everything went in the pressure cooker and cooked at 15 psi for about an hour and half. I ended up with a good 1.5 quarts of amazing duck stock. I used about a cup for the sauce and the rest is now frozen for other applications (possibly an oyster and duck gumbo to use up the last three birds I have in the near future). The sauce is prepared like a traditional red wine sauce made by simmering red wine and aromatics with the addition of chopped fresh beets. I added the beets for color and flavor, another item that to me sounds Germanic as well. After the wine is reduced I added in the duck stock and allowed that to reduce a bit as well before enriching with a bit of butter. The sauce had everything I was looking for a rich color and deep flavor. About a month or so ago I finally got all my plans in order and booked a hunting trip with a local guide to see if I can get myself some wild ducks. It’s been many years since I’ve been hunting but finally I get myself a gun, license and practiced some clay shooting at local range to get the rust out of my shooting. In no small way I have Hank Shaw to thank for the motivation. To say his hunting, fishing and cooking articles at his blog and in his book, “Hunt, Gather, Cook: Finding the Forgotten Feast” were inspiring is an understatement. All in all, I ended up with several mallards that day and a couple of nice teal. Teal are small, about the size of a pigeon and are supposed to be delicious so I wanted to show them off by cooking them whole. I roasted them simply by following Hank’s instruction. I first seasoned them with salt and a mixture of orange zest, allspice and thyme. I then baked the birds in a very hot oven to a medium rare. That worked well for the breasts, but honestly I was not crazy about the texture of the legs. They remained a bit tough for my liking and the skin did not crisp as well as I would’ve liked either. The flavor of the teal though was very good. They tasted rich and robust but not too gamy. I’m glad I made a full-flavored sauce to go with them. The sauce is from a Mario Batali recipe in the Babbo Cookbook and it’s not much more than a reduced red wine sauce flavored with allspice and cloves. Batali serves it with venison and a pumpkin caponata. I took another page from that recipe and made a much simplified version of that caponata using Delicata squash which is amazingly sweet. I roasted it and then tossed it with sauteed onions, raisins and red wine. To make this more substantial I tossed the squash with cooked farro. The combination was very tasty, like a rustic and comforting risotto. The flavor of the birds was wonderful with the spiced wine sauce and the earthy squash farro. Fall is finally here -more or less I suppose- and changing the way I cook is natural. Even if I can find tomatoes and peppers well into November and December I still prefer to cook more “orange” and “brown” stuff. It makes me and Diana happy to pick up some winter squashes or sweet potatoes and start cooking with them. This dish has neither but it just smells and tastes like fall. 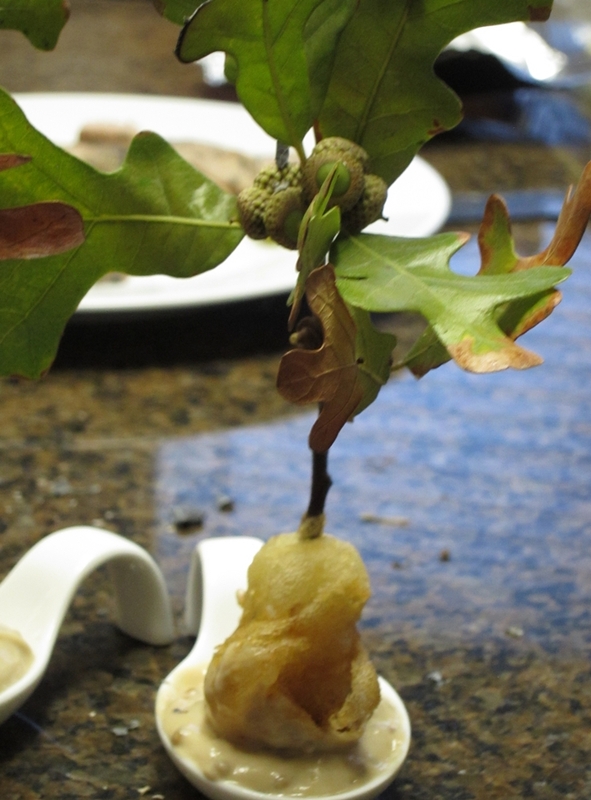 The biggest pain in the neck in this dish was finding a suitable oak twig. It’s supposed to be fall leaves, nice and orange-brown. Well in Houston you can typically only find green or dead brown. So I had to settle for somewhere in between. So I got a few twigs from one of the oaks that line a street close to work, the leaves are half brown half green, but overall not too bad. The recipe is pretty simple, a cube of meat (in the book he uses pheasant), a cube of apple cider gel and a piece of roasted shallot are skewered together on the sharpened oak twig. 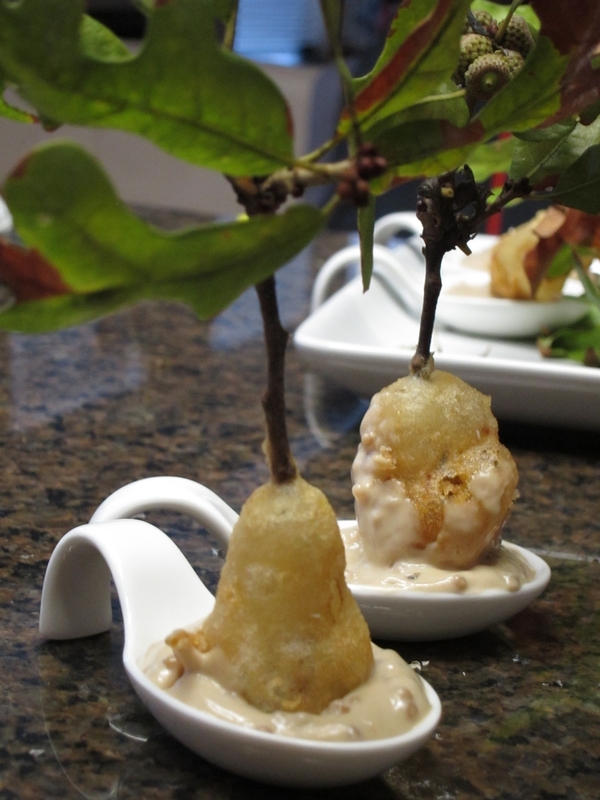 These are then dipped in tempura batter and deep-fried. 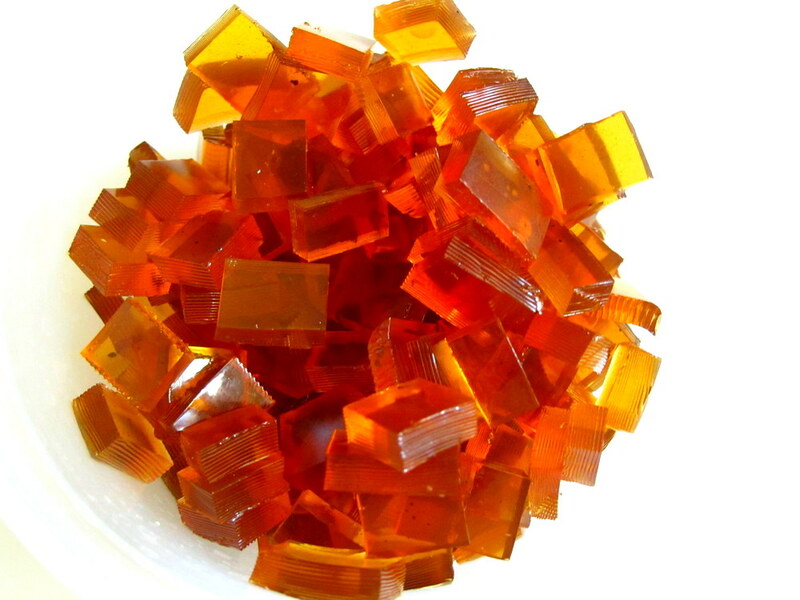 The cider gel is made with granny smith apples, some sugar and apple cider all cooked together with agar and pureed. It’s basically apple sauce until it is poured in a pan and allowed to cool. Then the agar turns it into a firm block. I cut it up into cubes and stored them in the fridge. 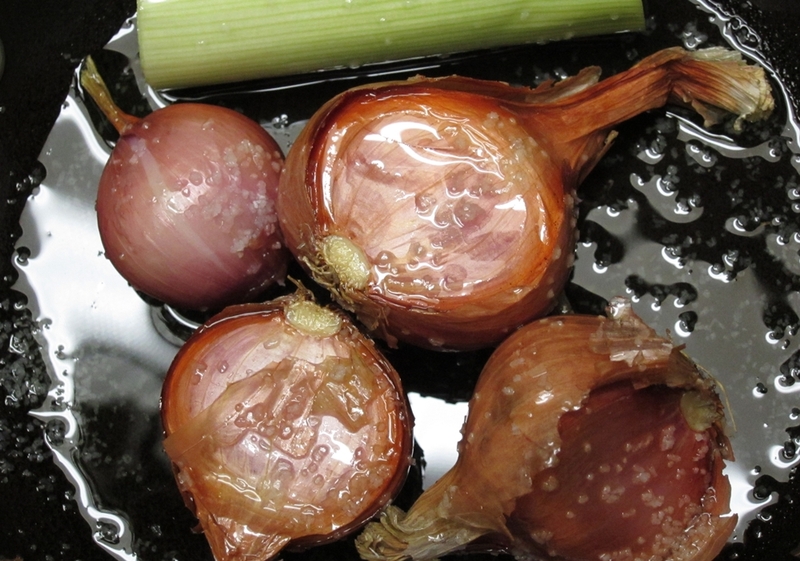 The shallot confit is just shallots roasted with grape seed oil, salt and pepper. Then the shallots are peeled and cut into rough cubes. Last piece is the meat. I do not currently have pheasant, but I do have some wild boar still. So, I used a small loin. 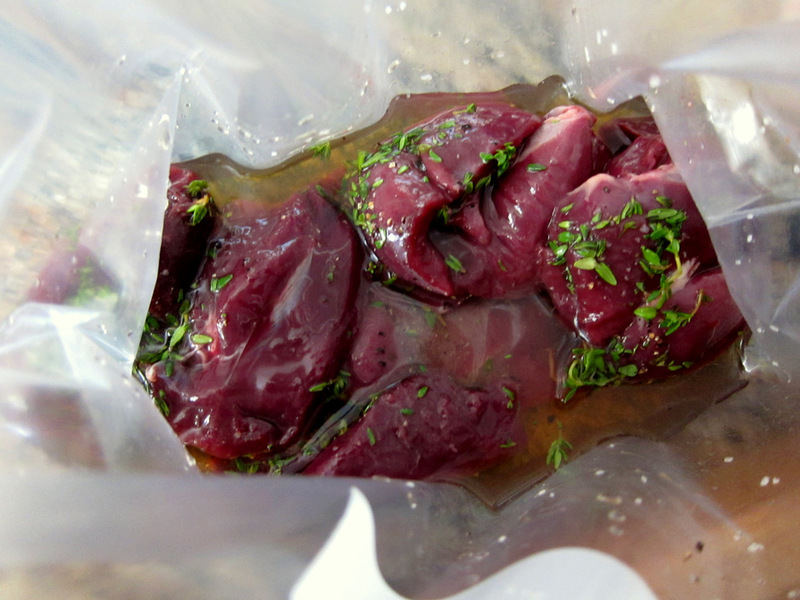 I cooked it sous vide bagged with butter and thyme. 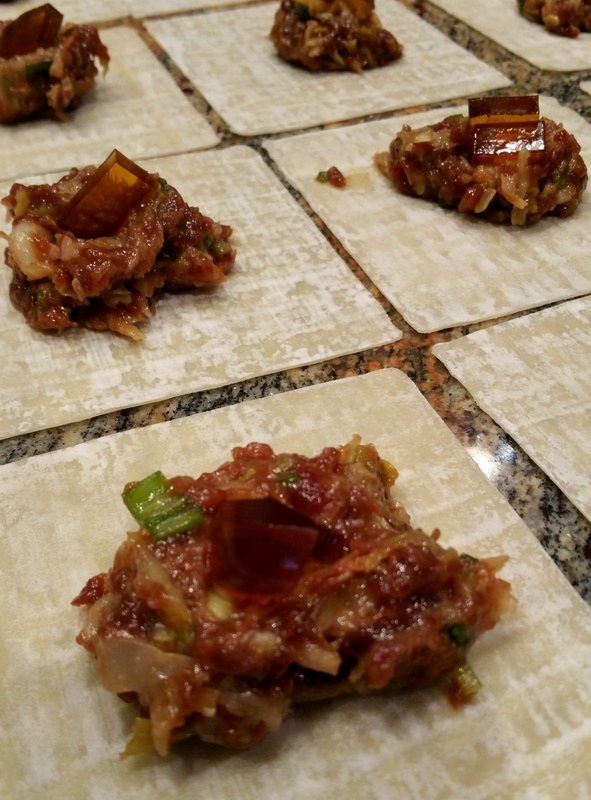 This was also cut up into cubes until serving time. For the batter I deviated from the recipe and used the procedure from Modernist Cuisine. It’s the same process I used before to make Heston Blumenthal’s extra crispy fish and chips. 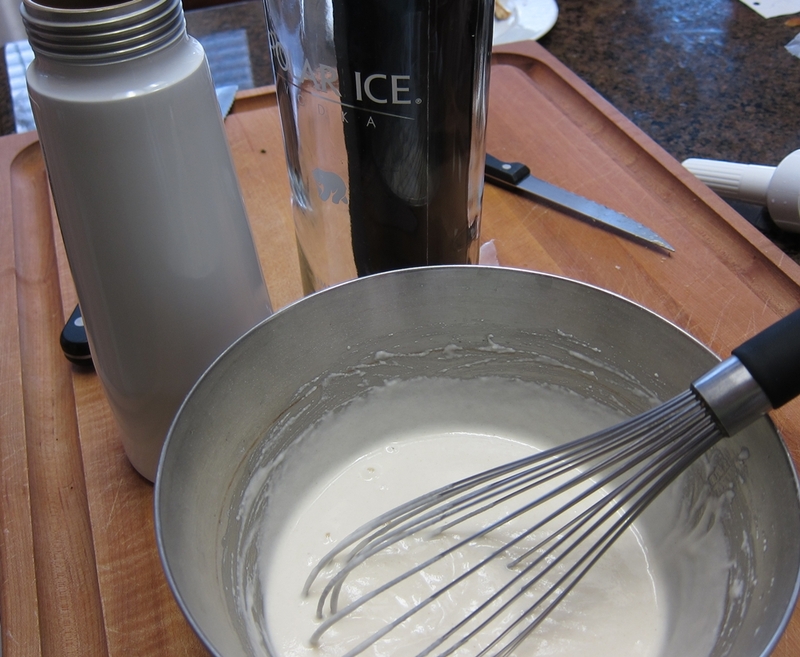 The Blumenthal batter is a mixture of rice flour, all-purpose flour and vodka. You put that in an iSi whipping siphon and charge it with CO2. Right before using it to coat the meat, you dispense some batter into a small bowl and dip the meat in it. The batter will have so much air bubbles that it makes for an extra crispy-crunchy product. It’s important to point out here that frying the boar-cider-shallot skewer without dropping the whole twig in the hot oil is also tricky. I basically could only fry two at a time since I had to hold the oak twigs while the stuff on its tip fried. I wrapped the leaf end with aluminum foil to make them easier to handle while frying and to catch the splatter and this batter sure does splatter! 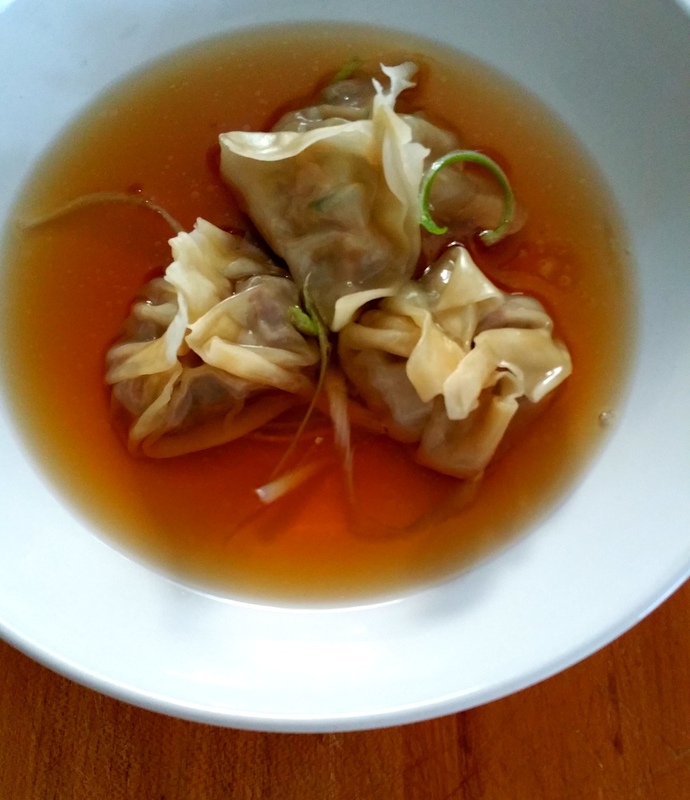 Last challenge in this “simple” recipe was plating. At Alinea they use a piece called the “octopus” to plate items like this one that has no base and need to stand upright. You can see it here in Allen’s Alinea book blog (he’s very dedicated and it sure shows). I was not going to buy or make anything like that. So, I made a thick sauce for the food thinking it will help it stay upright. It was a mixture of pickled mustard seeds, mayonnaise, mustard and maple vinegar. The sauce with the crunchy bite of food worked very well, but I cannot say that it made the plating that much easier. 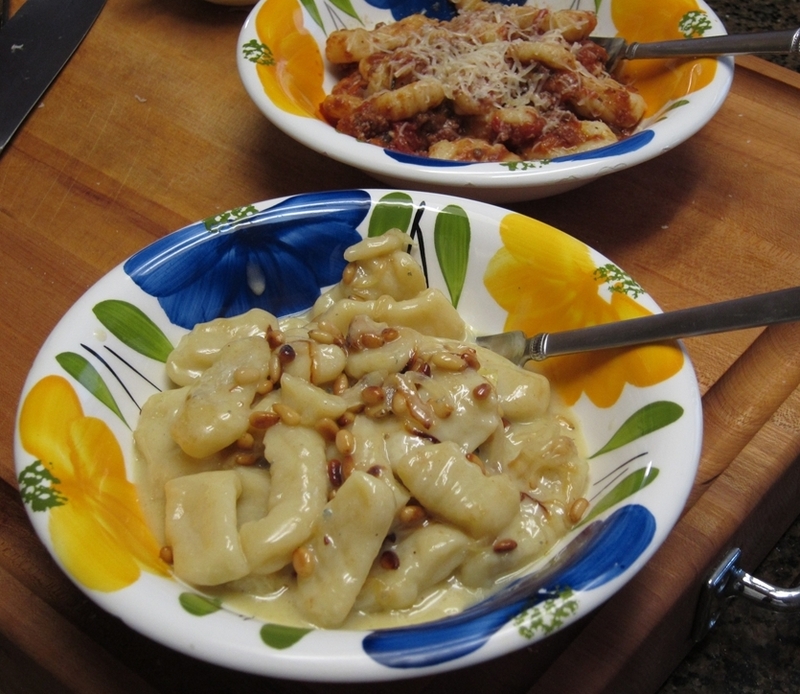 Paula Wolfert has a straightforward recipe for gnocchi in her Mediterranean Clay Pot Cooking book. At first glance I was not sure how the recipe would work. It has no eggs at all and little flour, a portion of which is cake flour (ie has very little gluten). After making those a couple of times though, I can definitely say that the recipe works! 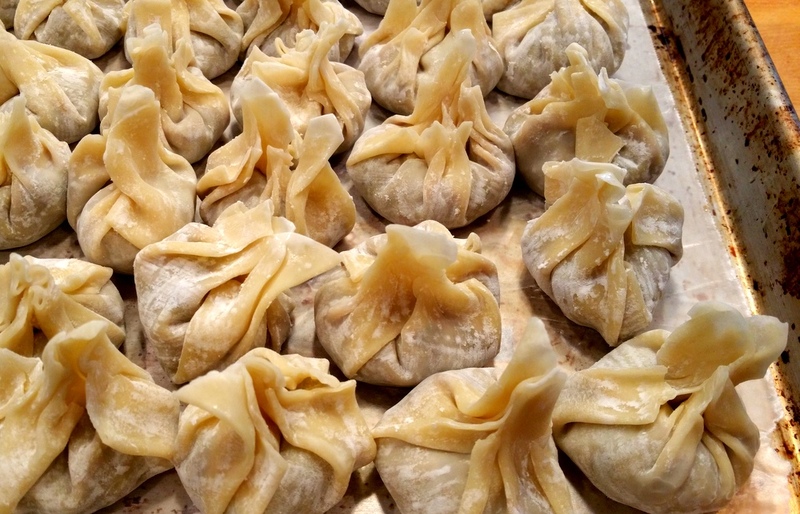 It produces soft tender dumplings that are full of delicious potato flavor. I suppose one can add an egg to make a firmer gnocchi (Diana likes them firmer), but it really is not needed. Here is a streamlined step by step guide to making these guys. Prick 2 lbs potatoes all over with a skewer and bake them on a 1-inch layer of salt at 400F for an hour and half. This really is the key step for success. 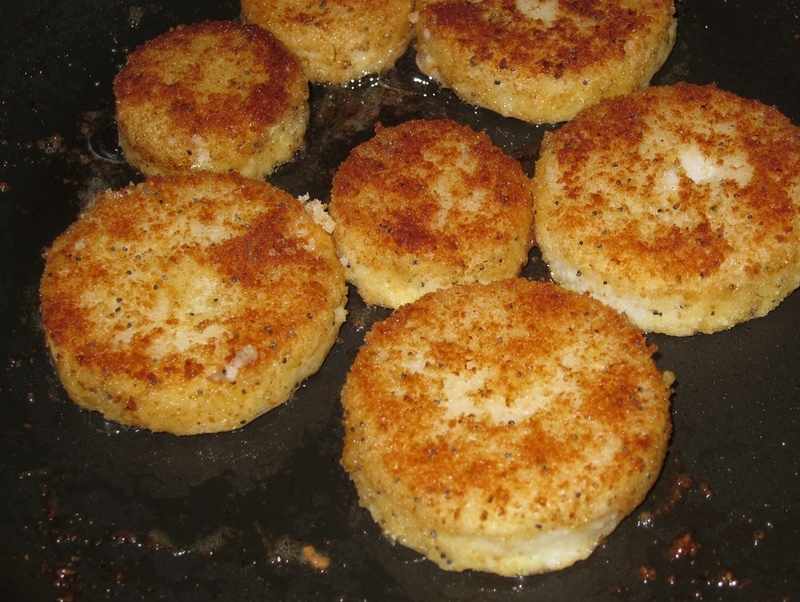 Baking the potatoes as opposed to boiling them leaches moisture and concentrates the flavor. 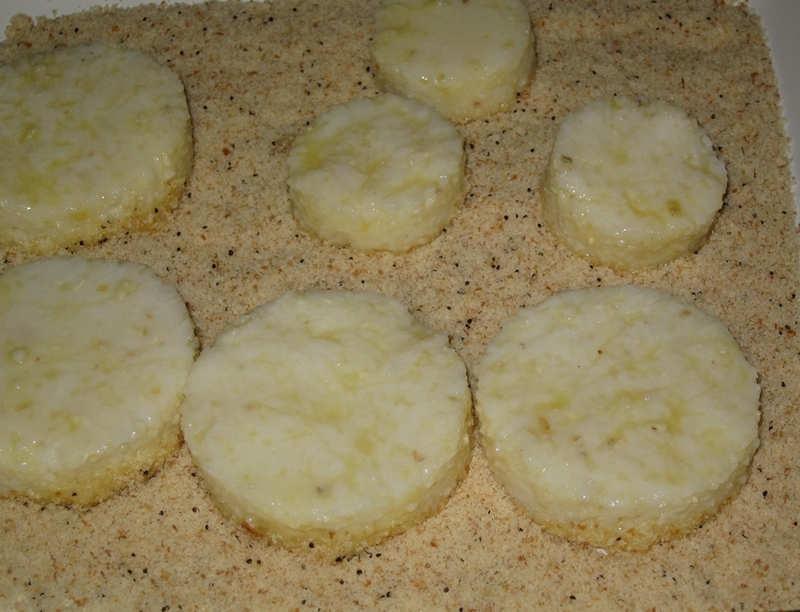 Baking them on a bed of salt further helps dry them out. Too much moisture in the cooked potatoes makes gnocchi dough very tricky to work with and could cause it to turn gummy. Peel/scoop the flesh out and pass it through a ricer. Spread the potato on a baking sheet and allow them to dry for 30 minutes. For 1 lbs of cooked potato flesh mix in about 160 gr all-purpose flour, 75 gr of cake flour and a pinch of salt. 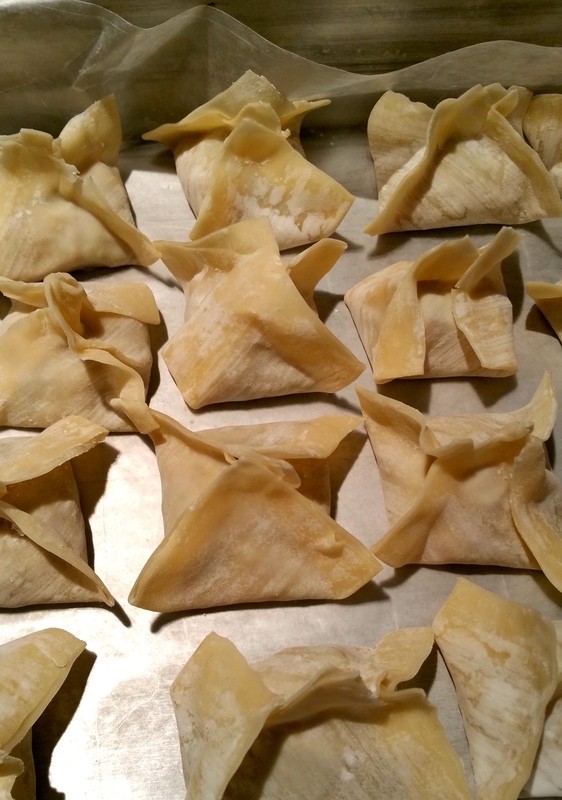 Fold the dough gently together until it forms a smooth ball. Divide the dough into 4 pieces. Working one piece at a time, roll them into 1/2 inch thick ropes and cut the rope into 3/4 inch pieces. I got lazy on some of these and made them a bit bigger. 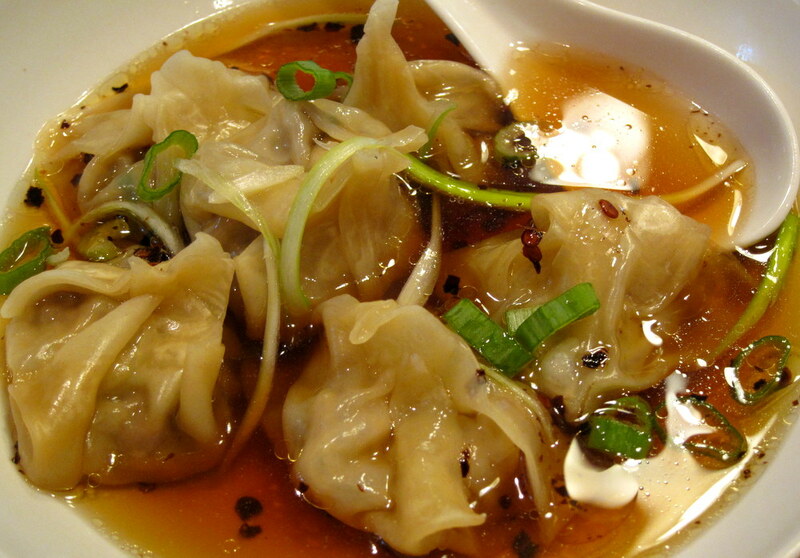 Roll each piece gently on the tines of a fork to create ridges on the dumplings. Cook the gnocchi in boiling salted water until they float. Move them to an ice bath and then strain. Now they can either be used right away or tossed in a little oil and stored for a couple of days. From this point on all you need to do is toss them in some kind of sauce. I made two different sauces. 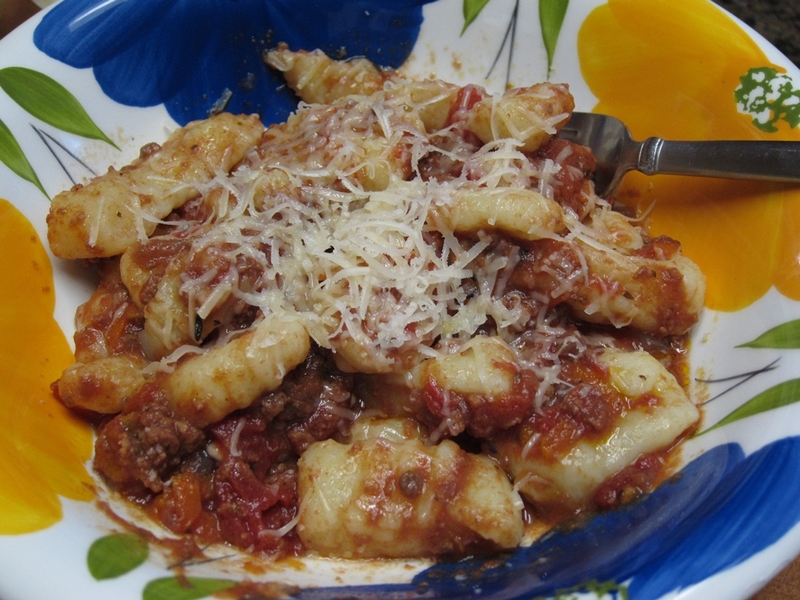 One was a venison ragu; slowly cooked ground venison, a little tomato, milk and aromatics. The other was based on one of Ms. Wolfert’s recipes in the same book. 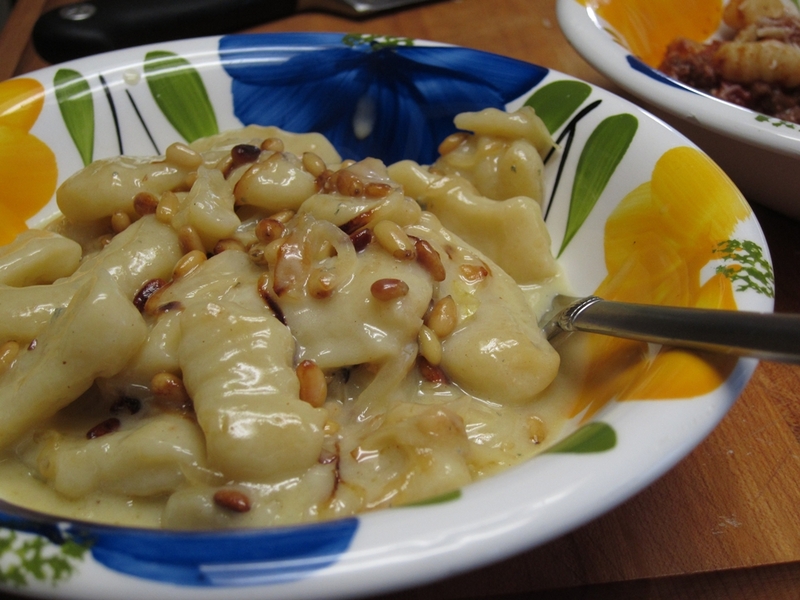 She sauces the gnocchi with a mixture of gorgonzola and pine nuts. I made a gorgonzola sauce using the Modernist Cuisine technique that adds sodium citrate salt to create an amazing smooth and creamy cheese sauce. I also toasted some pine nuts and caramelized onions and tossed them in there. This was a luxurious and very delicious sauce.